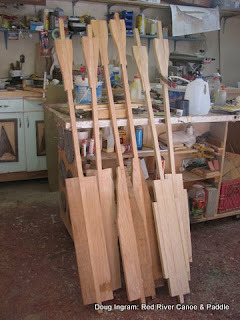 One of the paddle making techniques that I use requires a laminated shaft. 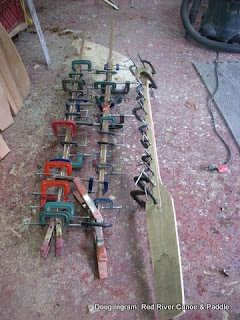 To get a good glue-up lots of clamps are needed. Sometimes all of them! My usual paddle is made from a central shaft and book-matched wood for the blade and grip. The shaft is first cut over large, the internal tensions of the wood are allowed to be released, then it is milled perfectly straight. Doing this ensures that the paddle shaft will remain straight. Using book matched wood for the blades and grip make the paddle look more attractive than random pieces. 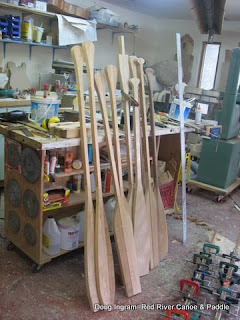 Once the glue cures, the patterns are laid out and traced, then the paddle blank is cut out, ready for the next steps. Posted by Doug Ingram at 8:05 a.m.